We have been flat out over the past week with plenty of progress, our aim was to try and keep this car rolling as long as possible. Impossible Fabrications have lots of different projects on at the moment and having this car take up a hoist for too long simply isn`t an option. So we set ourselves 2 goals, Get the motor sitting in the cradle cut the tunnel for the gearbox. The first step to this was to remove all the hard brake lines and fuel lines that are clipped into the firewall. These lines can be bent but not forced, We want to retain as many factory parts as possible, this includes hard brake and clutch lines, factory booster and clutch as well as the headlight loom and factory fuse box. Once these lines were off it was time to clean it up and strip the other side (inside the car) because Honda didn’t want anyone cutting a tunnel in their little Civics, they made sure to run the body loom and the only other wires that we are keeping right in the middle of where we need to cut, This wasn’t a big issue, just a time consuming one. Here is the weight reduction mod we completed on our firewall, it is just a guide to make sure the gearbox will even fit in this car (6 speed) we will clean it up once we know where it will be sitting. Here we go, the moment of truth, we removed the shifter but left the gearbox attached as it was easier to check the motor and box at the same time, our aim with this was to keep as much of the motor together as possible, the more we took off the more we had to bolt back on once its in. We needed to make some small adjustments to the floor to get the box in as it was longer than we thought, this is going to move the shifter location back about 6cm behind factory but i think i can live with that. The hardest part of the front end was to make sure we had it centred and level, Luckily when Grub was putting the front end in he took his time, the box is DEAD centre and fits perfectly into the body. As you can see once we made some minor adjustments to the tunnel for the gearbox and trimmed some tabs off the firewall the motor sat perfectly. So perfectly in fact that we can still use the factory engine fan, radiator and airbox, The Dump pipe lines up with the space provided, the factory loom enters the firewall in the same (factory) hole. There is even room for a front mount cooler inside the rad support which means it will not be seen from the front of the car. Although the steering shaft doesn’t line up we are sure Daniel will fabricate a knuckle or an adjustment so that we will have no dramas. The Civic stock rear end is still in the car so the front is sitting low (1oomm) off the ground, This should change once we lower the back onto its new rear end. 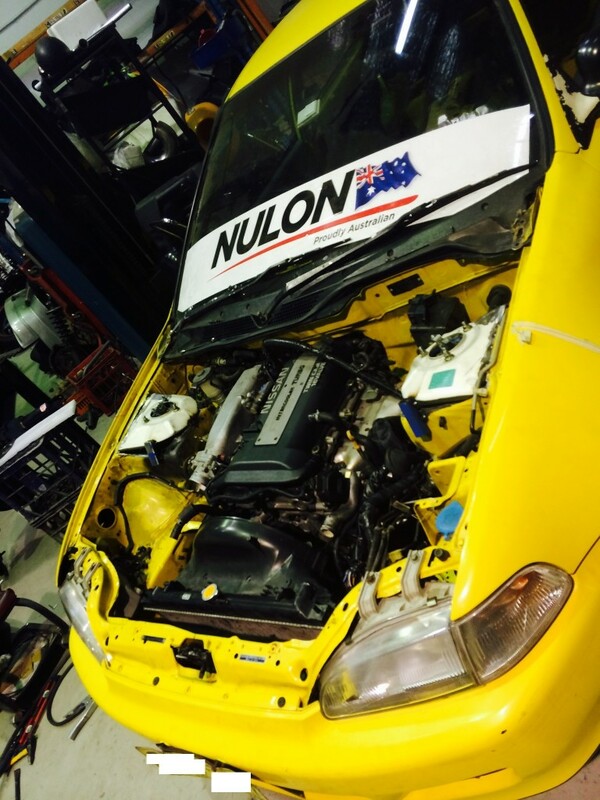 Subscribe to the Nulon blog for daily updates, Next up we are going to tackle to rear end and try and connect the dots in the middle somewhere.